The Cougars celebrate after their exciting and emotional victory on Thursday. *Photo courtesy of @MooneyBaseball. 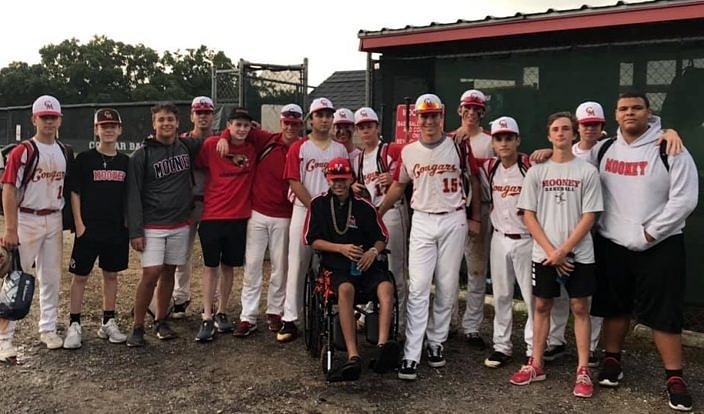 Thursday was a special day for senior Jaelen Childs and the Cardinal Mooney Cougars baseball family. 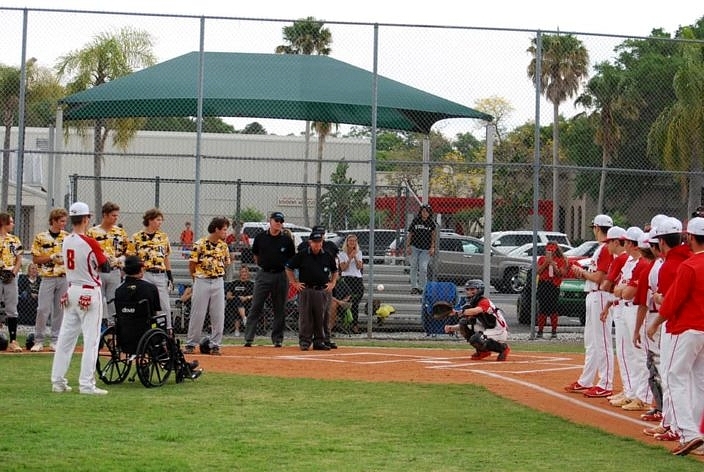 Hosting an important district contest against rival Bishop Verot, the team welcomed Childs back to the ball field for the first time since a horrific January car accident. 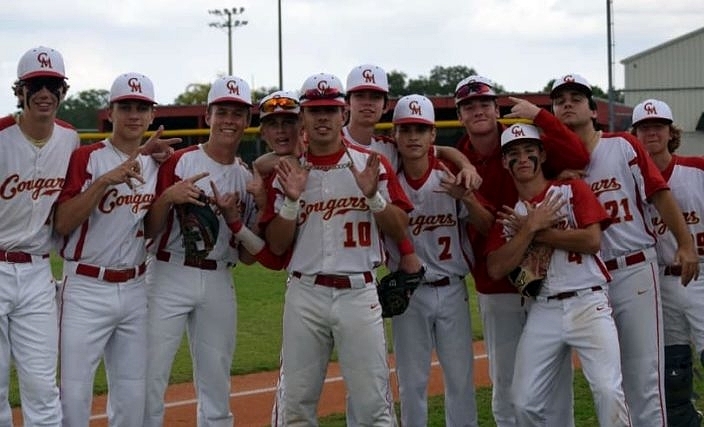 With their recovering teammate on hand rooting them on, the Cougars rolled to a 7-2 victory that gives them sole possession of the top seed in District 4A-5. Jaelen Childs has been through a lot since that night on January 31st, when a driver ran a red light and slammed into his car at an intersection. The accident left him with a crushed femur and shattered pelvis, requiring multiple surgeries and blood transfusions. Childs will be in a wheelchair for several months while he recovers. It was from this wheelchair that “Jaelen Strong” sat in front of the mound and threw out the ceremonial first pitch on Thursday, as teammates, family and supporters cheered him on. 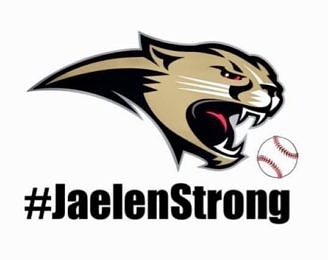 Efforts to support his recovery are everywhere, including a GoFundMe page started by a teammate, as well as many other fundraising efforts coordinated through the direction of #JaelenStrong. Being back at the ball field with the rest of the Cougars could be as helpful as anything. Jaelen Childs throws out the ceremonial first pitch. *Photo courtesy of @MooneyBaseball. Child’s presence certainly seemed to ignite the Cougars (9-6), who quickly erased a 1-0 deficit by scoring four runs in the bottom of the first inning for the deciding margin of victory. The Vikings (8-6) grabbed the lead with their first swings, as Daniel Blitz singled to lead off and later scored on an error. But it was short-lived. Cardinal Mooney capitalized on two straight fielding errors to take control. With two ducks on the pond, Paul Labriola lined an RBI single to right that tied the game. The hits kept coming, as Chase Binkley singled and Caden Chamberlin gave his team the lead with a base hit to center field. Dylan Robertson and Mars Moxley both followed with RBI singles to make it a 4-1 advantage. Jakob Jackson took care of business from there, going the distance for his third victory of the season. The junior right-hander allowed six hits and two walks, and struck out five. Bishop Verot managed just one more run, when Matt Powell delivered his second hit of the day for an RBI single that drove in Blitz in the fifth. Cardinal Mooney added three more insurance runs in the sixth. The Cougars loaded up the bases when Connor OSullivan walked, Tyler Copeland doubled to center and Aiden Troy also walked. Jackson came through with an RBI single to left and Labriola worked an RBI walk that closed out the scoring. Caden Chamberlain led all batters, going 3-for-3 with two RBIs. Labriola had two RBIs and Aidan Troy scored twice. Daniel Blitz was 2-for-3 with two runs and Matt Powell went 2-for-4 and drove in both runs for the Vikings. The two teams meet again on Friday night, this time with Bishop Verot serving as host. The Vikings will look to even things up for the district lead, as they are 4-1 and in second place behind the Cougars. Cardinal Mooney is 5-0 in 4A-5 and has won six straight district games, with its last district loss coming on April 17th, 2018. Jaelen Childs celebrates with his teammates after the big district win over Bishop Verot. *Photo courtesy of @MooneyBaseball.